Spring is a wonderful time of year. The season brings with it a sense of coming back to life after the winter. Baby birds are singing, flowers are blooming, and people around the world celebrate the end of the dismal winter weather with unique festivals and traditions. Novruz, a festival of spring, renewal and rebirth celebrated in Azerbaijan and across Central Asia, takes place every year between March 20-22. 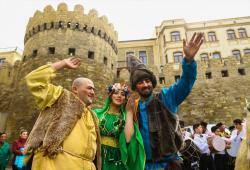 Scientific researches relate the Novruz holiday with the period of the prophet Zardush that dates 3500-5000 years back. 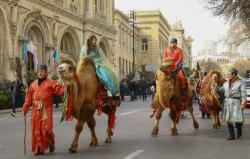 Each of the four Tuesdays falling before Novruz is dedicated to a different element. First is Water Tuesday, where water renews nature. Next is Fire Tuesday which honours fire as a method rebirth. Then it is Earth Tuesday marking the revival of the earth. Finally it is Wind Tuesday when the wind opens the buds and marks the arrival of Spring. 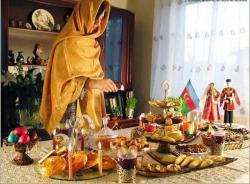 People do house cleaning, plant trees, paint eggs, make national pastries such as shekerbura, pakhlava and shorgoghal. Children run through the streets and knock on doors to ask for treats. 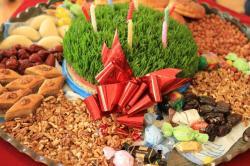 Novruz holiday is full of ceremonies and traditions. 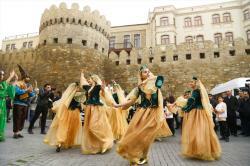 Being the land of the fire Azerbaijan has rich traditions relating with it. Everyone in the family should jump over the burning fire saying a special spell. When jumping, people say the phrase "Let the fire burn my pains". After the fire dies down, young people collect the remaining ash and pour it somewhere in the outskirts of the village or a road. Symbolically purifying fire burns all past failures. On the last Tuesday young people sneak to doors of their neighbors and "overheard" their conversation. The first words they have heard predict their fortune and if their wishes will come true. The holiday goes on for several days with festive public dancing and other entertainment of folk bands, contests of national sports. Beloved Novruz characters- Kechel, Kosa,Bahar gizi (Spring girl), as well as Dede Gorgud welcome and congratulate Bakuians during the holiday. On the eve of Novruz, people of Azerbaijan visit the cemetery where their parents are buried. Friends and families visit one another. 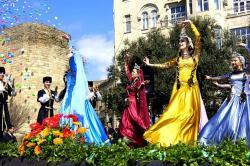 As with most major festivals in Azerbaijan, a significant part of Novruz celebrations revolve around food. The decoration of the festive table is khoncha, a large silver or copper tray with Samani (wheat) placed in the centre and candles and painted eggs representing the number of family members around it. The feast should consist of at least seven dishes the names of which starts with letter 'S', for example sumakh(a kind of spice), sirke(vinegar), sud(milk), samani(grown wheat), sebzi(fried meat with greens)etc. There's always lots of food and sweets at Novruz. With a filling made of nuts sugar, and aromatic spices, shekerbura,pakhlava, badambura, shor-gogal, mutaki are delicious sweet pastries traditionally eaten during spring feast. In the evening on March 21, all family members gather at home for dinner to eat a traditional dish called pilaf celebrate the spring holiday. In some parts of Azerbaijan, on the last night of the old year, family members sprinkle water on each other. This custom symbolizes the “washing off” of all the hardships of the old year. 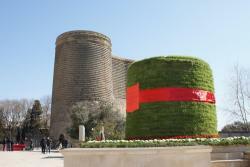 The holiday was given the status of an official holiday in Azerbaijan by a presidential decree dated 13 March 1990. In 2009, Novruz was included in the UNESCO Representative List of the Intangible Cultural Heritage of Humanity and since then, March 21 was declared the International Day of Novruz.